������ Mukdahan is a peaceful province located on the bank of the Mekong River, opposite Sawannakhet in Laos. The ancestors of the Mukdahan people migrated from Laos to establish the city in the late Ayutthaya period. The province has always been an interesting mixture of cultures from various tribes since ancient times. Moreover, it is a land of fantastic natural rock parks and is a major gateway to tourism in Laos and Vietnam. The province is renowned for its sweet tamarind fruit and features many natural attractions. Mukdahan has an area of 4,339 square kilometres and is divided into the following districts: Muang, Kham Cha-I, Nikhom Kham Soi, Don Tan, Dong Luang, Wan Yai, and Nong Sung. a) From Bangkok, take Bangkok-Saraburi-Nakhon Ratchasima-Ban Phai-Maha Sarakham-Phon Thong-Roi Et-Kham Cha-I-Mukdahan route. b) From Bangkok, take Bangkok-Nakhon Ratchasima route then use Highway No. 207 via Prathai, Phutthaisong, Phayakkhaphumphisai, Suwannaphum and take Highway No. 2169 via Sai Mun, Kut Chum and Loeng Nok Tha before turning into Highway No.212 and proceed to Mukdahan via Nikhom Kham Soi. There is no direct train from Bangkok to Mukdahan. Visitors can take a Bankok-Ubon Ratchathani train and connect a bus to Mukdahan. For more information, call 1690, 0 2223 7010-20. Visitors can fly from Bangkok to Ubon Ratchathani or Nakhon Phanom and then connect a bus to Mukdahan. Call Thai Airways, Tel: 1566, 0 2280 0060, 0 2628 2000 for more information. Kaeng Kabao is an islet that parallels the Mekong River. A wide rock plateau on the bank is popular for villagers seeking relaxation. Islands and beaches emerge in the middle of the river in the dry season, making the area more picturesque than in other seasons. To get there, take Highway No. 212 (Mukdahan-That Phanom) for 20 kilometres and turn right to Wan Yai and drive for 9 kilometres. Kaeng Kabao is 9 kilometres north of the district office. Tat Ton Waterfall is to the south of Nong Sung and west of Kham Cha-I on Highway No. 2030, 18 kilometres away between the 67-68 km markers. The waterfall is 7 metres high and 30 metres wide. A pool here is suitable for swimming. Wat Phu Dan Tae, or Wat Phutto Thammatharo, is on Highway No. 212 at the 134-km marker at Ban Chai Mongkhon, Tambon Chok Chai, about 15 kilometres from town. The temple is on a rock plateau and houses a large standing Buddha image with a halo on top. The image is clearly visible from a distance. Chao Pho Chao Fa Mung Mueang shrine is on Song Nang Sathit Road. It is here that the city shrine is located. It is believed that the shrine was built at the same time as the founding of the city. The people of Mukdahan regard the shrine as a sacred place that preserves the city's happiness. Chao Mae Song Nang Phi Nong Shrine is on Samran Chai Khong Road, next to Mukdahan immigration checkpoint. No records exist of its origin but it is regarded to be as sacred as the Mung Muang Shrine. The locals hold a celebration to pay homage to both shrines in May every year. Phu Mu Forest Park can be reached by taking Highway No. 212 to the 128-129 km. markers, then take a left-hand road for 12 kilometres. Phu Mu (Pig Mountain) is 353 metres above sea level and has a mountaintop plateau with an area of 4 square kilometres. Wild boars used to roam the area, hence, the name given by villagers. The summit has 3 vantage points, 100 metres, 400 metres and 800 metres from the park office, respectively. Visitors can have great views of Mukdahan from all 3 points. Wat Mano Phirom is at Tambon Chanot. 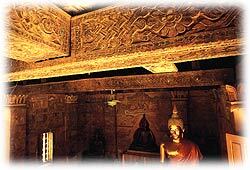 This old temple was built by Vientiane architects. A fire caused extensive damage to the temple in 1904, but it was fully renovated in 1911. The temple has buildings of interest such as the chapel and convocation hall, as well as Buddha images and a stairway, all reflecting beautiful local art. Wat Ban Song Khon church is the largest and most beautiful Catholic church in southeast Asia. Situated on the Mekong bank 6 kilometres from Wan Yai, or 25 kilometres from Mukdahan, the church was built to honor 7 Christians who sacrificed their lives to protect the religion. The wax figures of the 7 martyrs with their ashes inside are on display in the rear of the church. Wat Si Mongkhon Tai is near the immigration checkpoint. The temple houses an important Buddha image of the province, Phra Chao Ong Luang, an image built before the citys founding. This brick image is 2.2 metres wide and 2 metres high. According to legend, the first lord of Mukdahan discovered it while he was overseeing the citys construction. In addition, another image made of steel was found under a Bodi tree with only its top part protruding from the ground. Sawannakhet Province, Lao Peoples Democratic Republic is opposite Mukdahan. The second largest city to Vientiane, the province has routes linking Laos to Danang in Vietnam. To enter Laos, foreign travelers must have a valid passport and obtain a visa from either a Lao embassy or the Lao consulate in Khon Kaen. Mukdahan National Park (Phu Pha Thoep) is 17 kilometres from the city on the Mukdahan-Don Tan Road. To get to the park, turn right at the 14-15 km marker and drive for 2 kilometres. The park has an area of 48.5 square kilometres and consists mainly of many high mountains connected together like Phu Manorom, Phu Nang Hong, Phu Pha Thoep, Phu Tham Phra, Phu Lak Se, Phu Rang, Phu Pong, and Phu Kham Mak Mi. The highest peak is Phu Chom Si, which is 420 metres above sea level. The forest is a hardwood forest and is the source of several waterways. Some parts of the park are steep cliffs and wide rock plateaus. The most striking of these is Phu Pha Thoep where rocks of peculiar shapes abound. It is believed that this area was once a dirt mountain that eventually eroded due to rain and wind. Around the end of the rainy season in October, flowers of different colors bloom from the rocks, giving the park magnificent colors. Other places of interest include Phu Tham Phra, the largest mountain in the park. Visitors can find a waterfall and a cave where hundreds of small wooden Buddha and animal images are placed. Another site is the Tham Fa Mu Daeng on Phu Pha Thoep where numerous prehistoric drawings of hands and people can be seen. Drawn with red paint, the drawings are estimated to be older than 5,000 years. Ho Kaeo Mukdahan is a 65-metre-high tower, 2 kilometres on the Mukdahan-Don Tan route. The lower floor features an exhibition on Mukdahans history, another on the arts and culture of various tribes and the way of life along the Mekong River from past to present. The topmost part is an observation room where visitors can enjoy panoramic views of the Mekong River, Sawannakhet and Mukdahan. At this park, visitors can enjoy the magnificent panoramic views on top of the muntain and admire the beauty of a variety of rocks, flowers and lotus. Mahorathuk drum is kept at Wat Matchimawat (Wat Klang), not far from Don Tan District Office. This ancient artifact is over 3,000 years old. It is a single-sided bronze drum with a diametre of 86 centimetres and a length of 90 metres. The drum face has a sunrise design and the drum case has drawings of 4 frogs. The Kha and ancient Khmer people loved to collect drums. This drum was discovered in 1938 on the Mekong bank at Ban Na Tham in Laos. วัดสองคอนมีบริเวณกว้างขวางและมีพื้นที่ติดกับแม่น้ำโขง เปิดให้นักท่องเที่ยวเข้าชมและสักการะทุกวันระหว่างเวลา 08.00-18.00 น. คริสตชนสามารถร่วมพิธีบูชามิสซาได้ในวันอาทิตย์ เวลา 07.00 น.